For 2015 Ford is pulling its aging pony into the 21st century. There is now a direct injected, turbo, four available, and like it’s competitors the Challenger and the Camaro, it now has independent rear suspension.But before the most recent update, Ford made this 2013 Mustang Boss 302. It is one of 8000 examples of the best live rear axle pony car Ford will ever make. 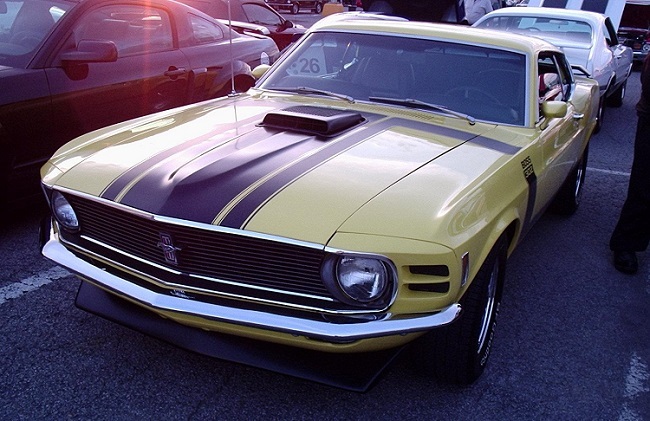 The name is taken from the 1969-1970 Boss 302, which was only sold to meet the Trans-am racing homologation regulations. Ford had to build a certain number of production cars before they would be allowed to use the Boss in the road racing series. The race car would go on to win the championship in 1969 and 1970. The street cars featured a freer flowing, higher revving engine and stiffer suspension. This school bus yellow piece of history costs $39,000. 40 years later Ford created this future classic. The 2012-2013 Boss followed the same philosophy as the original: a track focused car with more power and stiffer springs. 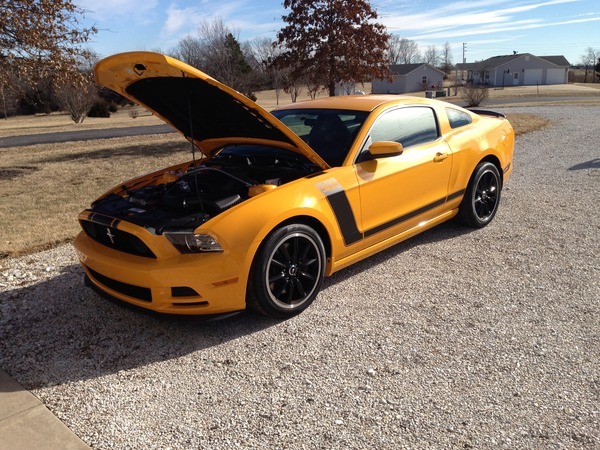 Its 5 liter V8 makes 444 horsepower, 30 horsepower over the standard Mustang GT. It also redlines 500 rpm higher. This is thanks to stronger internals, hot cams and a revised intake. The car gets bigger brakes to help it stop, and 5-way adjustable dampers on all four corners for better body control on and off the track. (Dampers are adjusted with a flathead screw driver, not electronically) Its quad exhaust system has two outlets in the back and one on either side of the car. This allows the driver and passenger to hear the Boss’s burble just that much better. On the outside the car gets C-stripe stickers, and a functional front splitter. 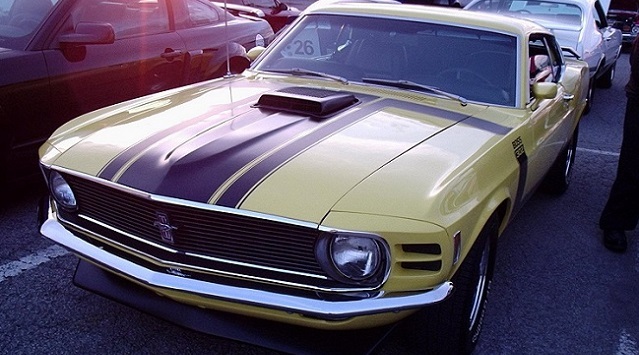 The Boss 302 is not the most powerful Mustang you can buy. It is down 220 horsepower on the Shelby GT500’s 5.8 liter supercharged V8, and 400 horsepower down on the Shelby Super Snake. The Boss is however the most powerful naturally aspirated Mustang Ford had ever made. It is also some 200 pounds lighter, has more neutral weight distribution and lower gearing than is super charged brothers.